GRP & fibreglass - what is the difference? GRP (glass reinforced plastic) is the technical name for what is commonly known as 'fibreglass'. Originally developed in 1938 for use in insulation, GRP is extremely durable and today is used in a variety of applications across a number of industries. Also known as FRP (fibre reinforced polymer) GRP is extremely versatile, strong and waterproof, making GRP the ideal solution for applications such as roofing systems. The ability to produce different finishes such as nonslip surfaces using GRP, in addition to being able to produce unlimited range of colour options for applications of almost any complexity, means that GRP is now a popular and viable alternative to traditional roofing systems used previously. How do I estimate the GRP materials that I need? Many glassfibre laminates made during the early days of GRP production in the 1940s are still in use today! Extensive testing has demonstrated the typical life expectancy of a GRP roof product to be well in excess of 50 years. And, tests conducted to date have shown 'no deterioration' infrastructure or performance throughout the testing period. Additionally, because GRP products or use in extreme conditions such as underwater, when used in the manufacture of boats, a GRP product applied by a specialist company could be expected to last a lifetime. What colours are available in GRP roofs? 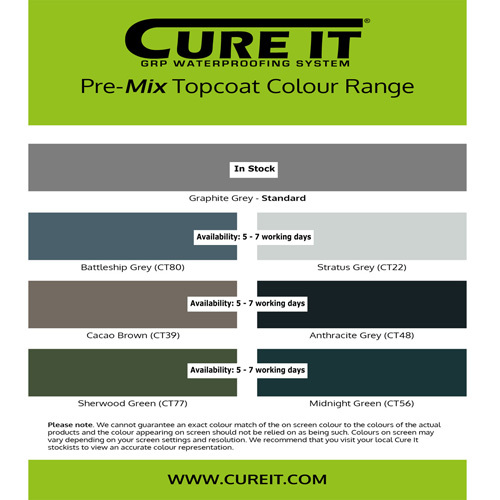 Cure It GRP topcoats are available from stock in pre-pigmented Graphite Grey (BS 00 A 13). The Cure It GRP topcoat range can also be supplied to special order (at additional cost) in a wide range of different colours - virtually any BS4800 colour in fact! GRP has a number of benefits compared to traditional roofing products, especially for flat roofing. There are a number of health & safety benefits from installing a GRP roofing system because GRP products are cold laid and therefore not require any form of heat treatment, helping to protect installers and the general public. GRP flat roofs are extremely durable and completely waterproof, plus they can be finished in any wide range of colours and include options such as nonslip finishes. The entire area on a GRP roof is encapsulated into one single continuous GRP membrane and there are no seams joints or welds. It is also completely UV resistant. Special features such as roof lights can also be included within a GRP roofing system. GRP roofing systems can also be used instead of pitched roofs or to make special features. The Cure It GRP range is Fire retardant to BS476-3 Ext.F.AB (no restrictions on usage) as standard for situations where fire safety is a necessity. The surface and colour of a GRP laminate can be modified to your requirements. A choice of smooth or textured finishes can be achieved in any colours from the BS 4800 range. GRP systems are ideally suited to adverse weather conditions and temperature extremes. As GRP is used to make boats and pond liners, it performs well when exposed to cold climates or heavy rain. GRP systems are capable of delivering maximum protection in excess of 50 years. Whilst GRP may not be suitable for applications above 100°C it will perform well within normal temperature extremes are found within global environmental conditions. GRP can withstand dilute acid conditions, it is unsuitable for prolonged immersion in alkaline solutions. A GRP roof is also fully bonded to the surface of the decking boards so it is very resistant to wind uplift. I want to install a GRP roof, how do I do it? While the process for laying a GRP roof is straightforward, there are a few rules of thumb that must be followed before installing a Cure It GRP roof. An average domestic garage roof of around 20m/2 can be removed, re-decked, laminated and topcoated within a day by a team of two people. The Cure It GRP range is the perfect product to use in the construction of balconies due to its strength and aesthetic properties. The product can be shaped or to any size or style. In most cases existing domestic flat roofs can be easily converted for use as a balcony, terrace or green roof. Balustrade posts can be easily incorporated into the roof for any commercial or domestic environment. And, because GRP is capable of withstanding heavy traffic and available with an non-slip finish, balconies can be constructed quickly and easily using the Cure It GRP roofing system. To complete your balcony design an extensive range of colour topcoats gives you a designer-look, which will be maintenance free, for life. High performance GRP walkways can be created: The durability and flexibility of GRP means that outdoor walkways or high volume walkways on roof areas can be installed with the minimum of ease. The properties of GRP systems makes it an ideal product to use for walkways, as it can be installed to any size and incorporate features such as rails and steps with ease. GRP is extremely strong and completely waterproof and will remain maintenance free for many years when installed correctly. A permanent choice of non-slip finish can be specified together with any colour of choice for your walkway. The Cure It GRP range can be specified to simulate lead for both lead flashings and lead lining applications such as gutters. Many roofing installers previously using lead have switched to GRP in the last few years because it is easy to dress around complex detail work, is much more cost efficient with an equivalent lifespan, more environmentally friendly and can be specified to simulate rolled lead ribs with the ER35/40 edge trim. In addition lead flashing can be easily replaced with pre-formed simulated lead flashing trim (C type trims). The trim range is ideal for replacing lead flashing to domestic brickwork (up to 150mm vertical cover) and is simple to fix using our trim adhesive. And once it has been installed it cannot be illegally removed re-sold as a lot of expensive lead detail work is increasingly being targeted for. The Cure It GRP range can be specified to line pond and pool areas. These applications can be of any complexity in any colour and can be used as part of a garden or water feature incorporated into a roof or as a stand – alone feature.